Winter wrens and Swainson’s thrushes serenaded us as we started our hike this morning. 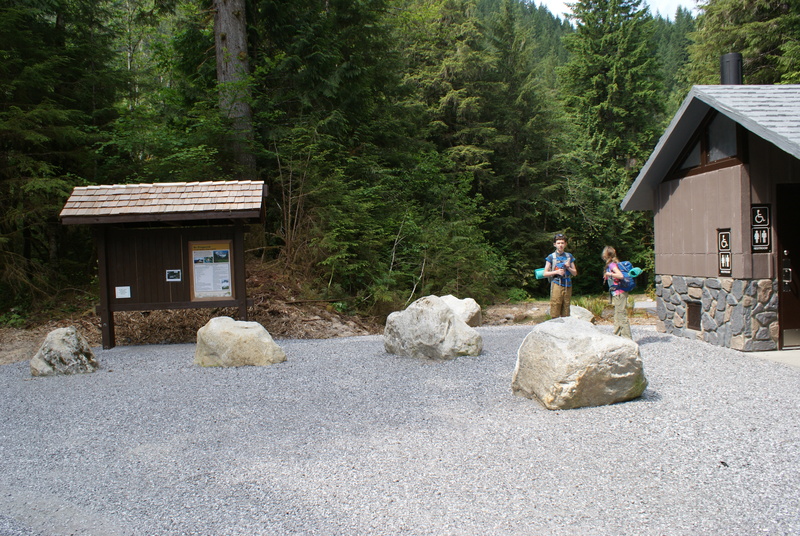 We appreciated the shiny new trailhead for Beaver Lake, as well as the spiffy, clean outhouse. 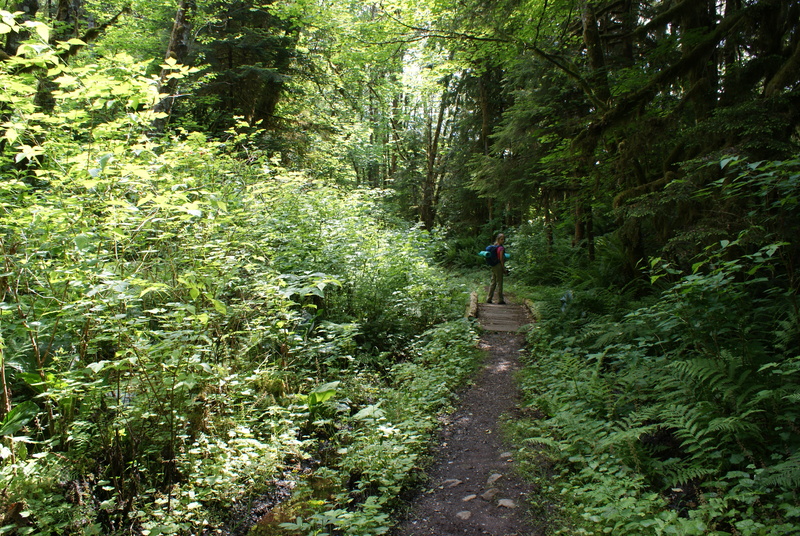 The trail dips slightly then follows an old railroad grade along the Sauk River. It’s shady and brushy at this time of year. The greenery is so lush sometimes we felt we were walking in a tunnel. Birds sang in the tall maples and evergreens (wish I were better at identifying their songs by ear), and butterflies flitted about the flowers. 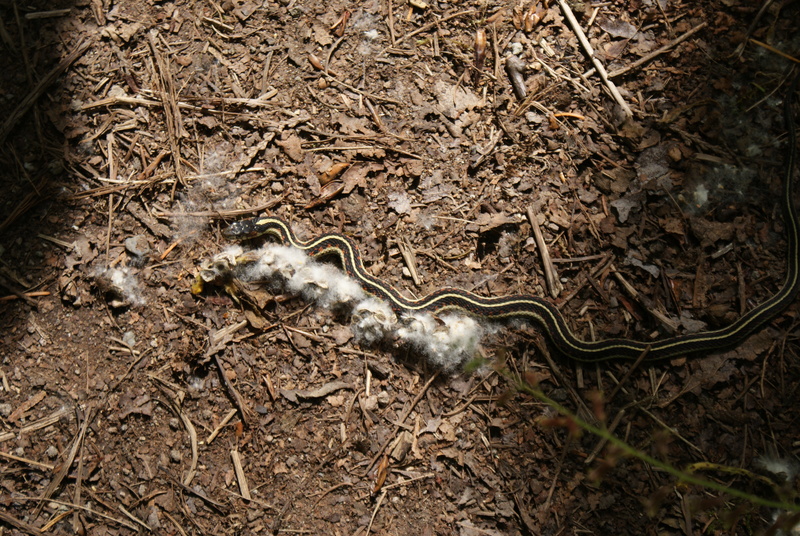 We saw a little snake, a snail, and several slugs. Unfortunately, the horseflies and mosquitoes were already out, too. 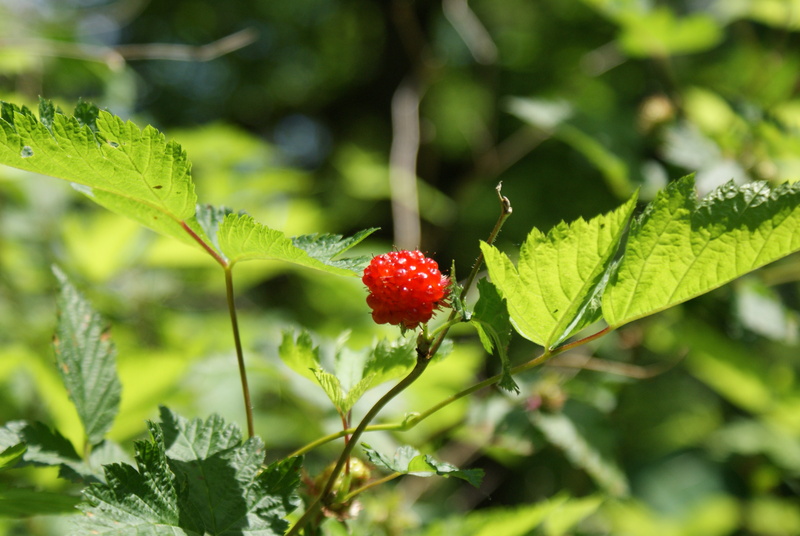 Plants in bloom included youth-on-age, buttercup, bleeding heart, bunchberry, salmonberry (lots of ripe berries!) and American speedwell. Today it was humid and hot and a bit uncomfortable. Despite the heat, we made good time to the beaver pond. We were going to stop there for a snack, but there wasn’t a good spot to sit, so we continued on a few more minutes to the end of the trail and the riverbank. 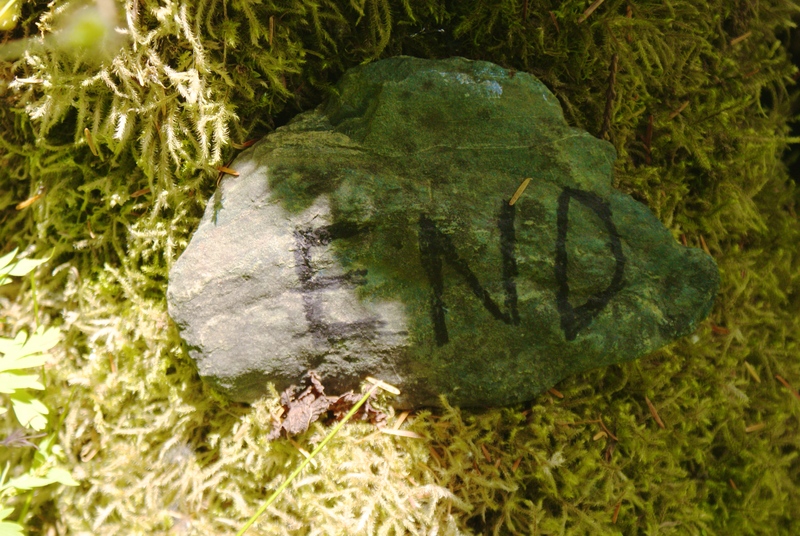 That last section of trail travels through some old growth trees, and there is abundant moss hanging from branches. We heard frogs and saw woodpeckers in this section. No luck on the beaver, though. The trail ends where a large washout dumped the tread into the river. We enjoyed our lunch there, and so did another couple with their dog. They were the only other ones on the trail with us today. We had no problems with the washout before the beaver pond; I found out after we got home that the rusty metal we could see sticking out of the bank were old railroad tracks. There was just a bit of mud today, but we enjoyed the multiple stream crossings with their gurgling sounds. We did need to be careful of stinging nettles, as some were hanging over the trail. Otherwise, it was a pleasant place to spend part of our day. 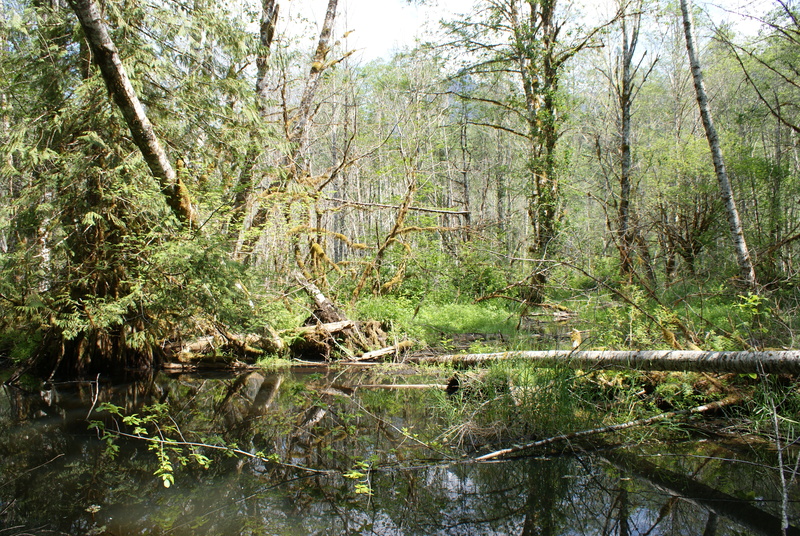 If You Go: The Beaver lake Trail is about 9 miles south of Darrington on the the Mountain Loop Highway. 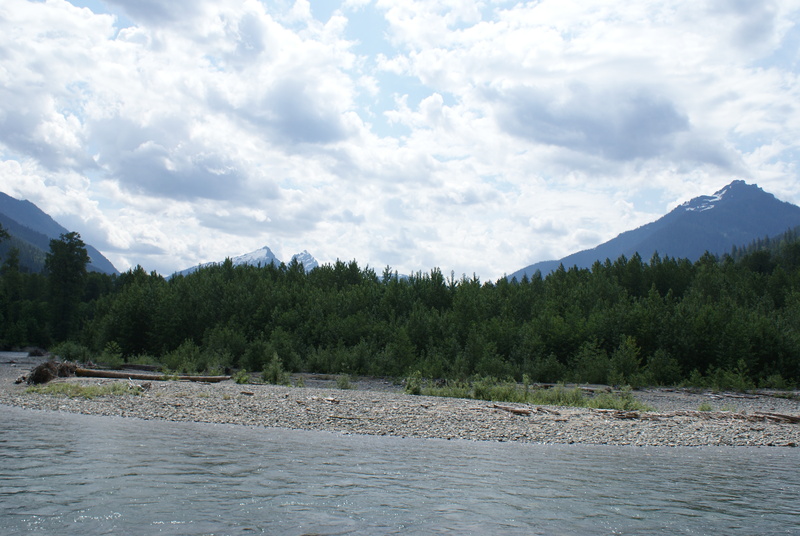 The trailhead is on the right just after you cross the bridge over the Sauk River. 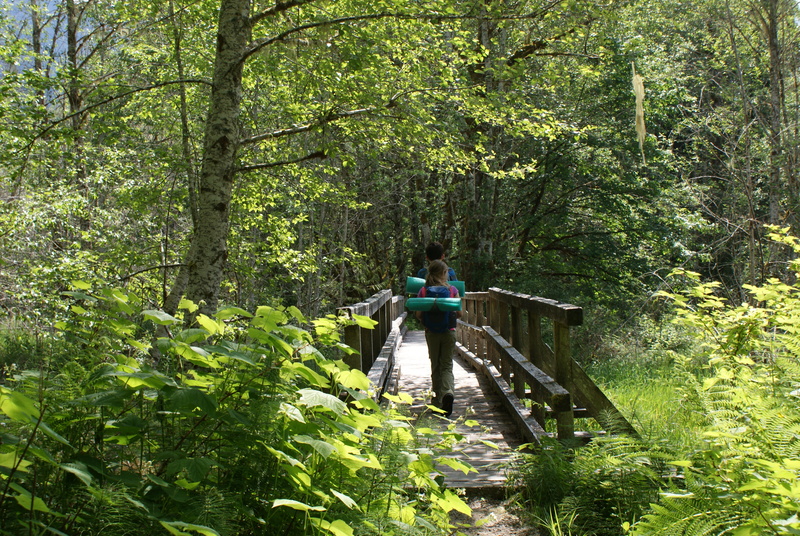 It’s a 4-mile round trip hike, with about 100 feet of elevation gain. There is an outhouse at the trailhead. I saw no signs indicating that you’ll need a NWForest Pass.